We require 48 hour notice to deliver. We deliver ​& pick-up bikes between ​8am-11am. If you are within the 48 hours, please call the store to make your delivery reservation. (850-231-0035). For information on complimentary bikes included with your cottage please visit the complimentary bike program page. Homeowner's Collection is proud to have an exclusive partnership with Seaside Transit Authority™, the official rental bike provider for SEASIDE®. They offer custom designed rental bikes for all our Homeowner's Collection guests at a discounted rate. 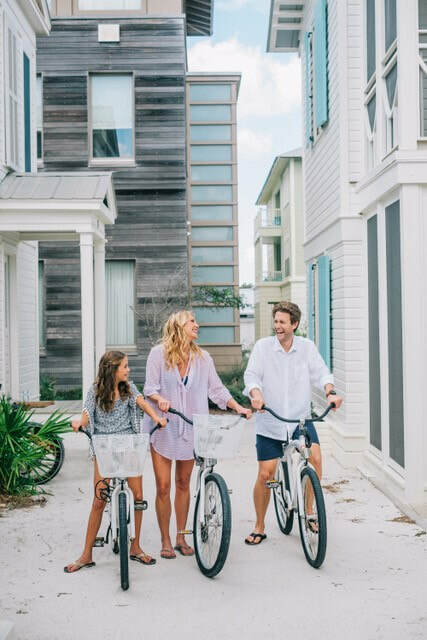 There is no better way to explore SEASIDE®, the beach and all that the 30A bike trail has to offer than on a custom designed Seaside Transit Authority™ beach cruiser. Seaside Transit Authority™ is the official rental bike provider for SEASIDE® and we offer a variety of rental items. Items available for your enjoyment include unisex bikes, men’s bikes, boys and girls bikes, tag-a-longs, tandems, adult trikes, kids trailers and cargo trailers for your beach gear. Adult bikes come with combination lock and helmet. Baskets are available for $3.00 each. Rent for the day, multiple days, weekly or monthly. Free delivery and pick-up to SEASIDE® only. Seaside Transit Authority™ is locally-owned and operated in Seaside, FL. Since opening in 2013, we’ve treated every customer like they were a part of our family. Other companies offer bike rentals, but no company can match the quality, safety and personal touch we offer.